Series Salute is a new series we are starting here at Intellectual Recreation. When we finish a great series we bid farewell with a write-up of the series as a whole. 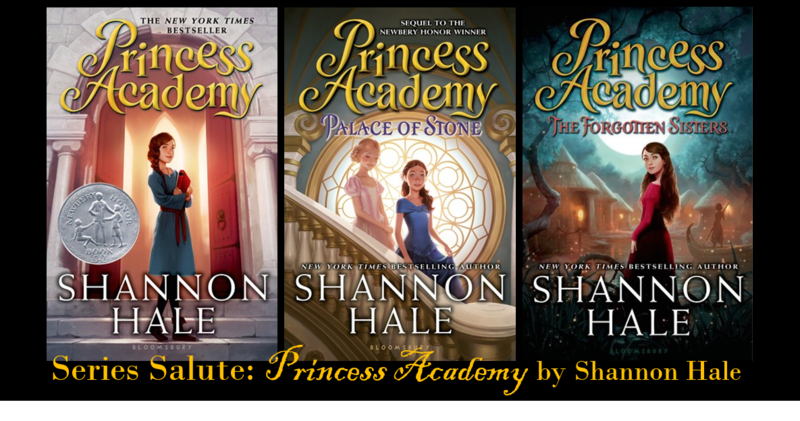 I'm so excited to bring you our first Series Salute featuring the incomparable Shannon Hale's Princess Academy series. This middle-grade series follows Miri, a girl from the remote Mount Eskel. In the first book she attends a princess academy, learns a little about the magic of the linder stone, and learns a lot about herself. In subsequent books Miri travels to other regions of the country of Danland. She continues her schooling at the Queens College, gets involved in a revolution, becomes a teacher, and tries to stop a war. I love this series, and I know that Paige does too. Miri is a solid, strong character. I loved her more with every book. The series has a great cast of endearing supporting characters, as well. Pick this series up even if princesses are not really your thing. Miri is not a princess, and there is plenty of adventure and high-stake drama. There's also a bit of a romance. The writing is also excellent. This is one of my favorite middle-grade series. The 2006 Newbery Honor Princess Academy was actually the very first book by Shannon Hale that I ever read. Miri and many of the other girls of her village are taken to a princess academy when the priests of their country divine that the next princess will come from that village. I loved reading about Miri's world and how the academy opened her eyes to learning, helped her understand herself and gain a deeper appreciation of her home and its customs. 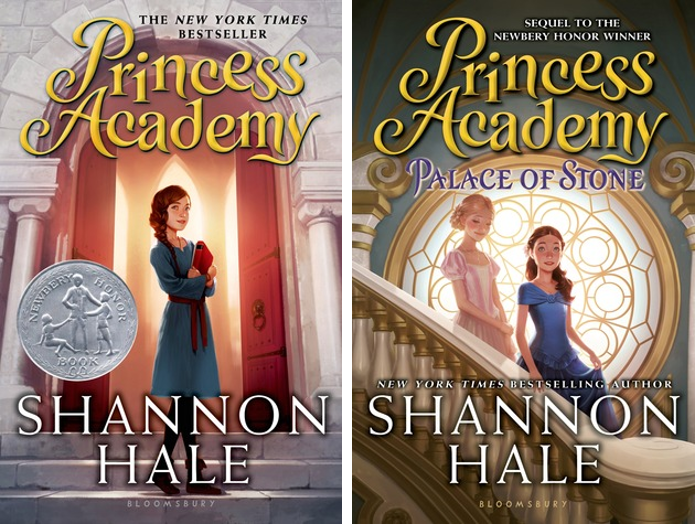 My reading of Princess Academy actually set me on a Shannon Hale streak, and I read five more of her books (all she had published at that point) within as many months. 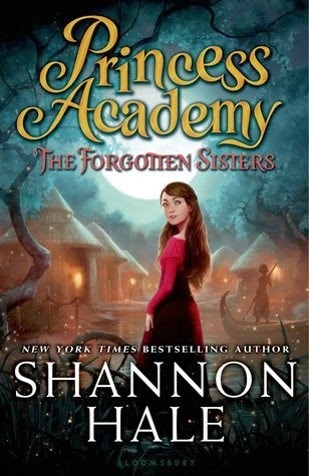 After several years, in 2012, Shannon Hale published a sequel to Princess Academy. In Palace of Stone, Miri and several of her fellow princess academy graduates travel to the capital. There is much unrest in the city, and Miri gets swept up in the fervor of the revolutionaries. Palace of Stone is about how new locations and new situations can change a person. Miri spends a lot of time thinking about who she really is. A great deal of the story is wrapped up in the revolution and the intellectuals who serve as its leaders. The revolutionary leaders tend to use logic to support their actions without considering ethics or morality, and Miri struggles with this. Palace of Stone would be a great way to introduce children to the shortcomings of logic and the fallacy of "the ends justify the means." The third and final addition to the Princess Academy series came out just last month. It is an absolute delight. Miri is on her way back to Mount Eskel when she receives a summons from the king. The neighboring kingdom of Stora is threatening invasion but may be placated with a royal Danlandian bride. Miri is to go to the swamps of Lesser Alva and establish a princess academy there where she will prepare three forgotten royal cousins to wed a king. Conditions in the swamp are, well, pretty bleak. The girls, Astrid, Felissa, and Sus, are completely wild and not at all interested in courtly affairs or book learning. In fact, they don't have time for any of that nonsense. They are too busy just getting by. Miri, now stuck in the swamp with the sisters, must make this work somehow. The Forgotten Sisters is full of really poignant emotions. And I loved this best about the book. Miri is miserable in the swamp and fiercely misses Peder and Marda, but then she begins to love the girls and understand their lives. This transition is communicated so eloquently. Astrid, Felissa, and Sus are fabulous additions to the series. Fully developed and every bit as likeable and unique as any of the girls from Mount Eskel. The Forgotten Sisters is also not without its share of high-stakes drama. Soldiers. Pirates. Snakes. Caiman. The Chief Delegate. Bandits. Epic Escapes. You get the picture. It's all in there. Miri's linder magic continues to develop in the most intriguing ways. Linder helps her unravel these sisters' secrets. Peder is stalwart and fabulous as ever. And I just loved Miri's educational lessons and how they came to matter in late chapters. As Miri says, "Think of learning as storing up supplies you may need for a harsh winter." The Forgotten Sisters is out February 24th.